The first in a triple bill of Cantabrian mountain finishes saw BMC’s Alessandro de Marchi wear down the resistance of his four breakaway companions, riding away into the mist at the flamme rouge to take a hugely deserved victory. A fascinating tactical battle waged amongst the GC favourites but Fabio Aru retained the red jersey. The Vuelta’s longest stage saw the GC favourites keeping their powder dry, allowing a strong five-man break away to build a huge lead of over eight minutes as they crested the second climb of the day. With Astana riding tempo at the front of the peloton across the plateau of doom towards the finish they were never going to be caught, and all that remained was to see which of the five would take the win. Mikael Cherel (Ag2r La Mondiale) attacked first with 5km to go and again with JJ Rojas (Movistar), but each time de Marchi took his time before reeling them back in. Finally after chasing down Sky’s Salvatore Puccio he launched a volley of his own in such a manner that he flew away in the final kilometre with no one on his wheel, emerging out of the fog with a fist-pump over the line. As the breakaway five played their cards for victory, the GC riders were making their first moves in a cat-and-mouse game. Fabio Aru kicked away on the steepest gradients with 3km to go taking Nairo Quintana with him. But despite climbing all over his bike with the effort, the Italian couldn’t hold off the counter-attacks by the Colombian, Joaquim Rodriguez and Esteban Chaves. He did however bank valuable time on Tom Dumoulin and will be looking for more tomorrow. It has to be Alessandro de Marchi. He fought like a demon to be in the break, worked like a trojan to help keep it away with such a big time gap, rode with such belief when the attacks started to fire, and then pounced with devastating effect to grab the win for his team. We LOVED it. Cherel was the strongest, I had to shut down his attacks and I was worried about Puccio too. Fortunately I could get ahead of him, but I never expected to take so much away from this break. I won more with head than with my legs. And with my heart. This is his second Vuelta win, the first in 2014 also coming after being in a breakaway all day. It’s something he specialises in and it really could not have come at a better time for his team who, having already lost their team captain Tejay van Garderen last week, also saw Samuel Sanchez withdraw today with an infected foot. 1. Shaken but not stirred. The filmed briefing in the Giant-Alpecin team bus today was all about how the other teams would try and take time from Tom Dumoulin. Movistar and Astana took control at the front and while they certainly upped the pace on the final climb, it was never enough to seriously hurt the Giant leader. 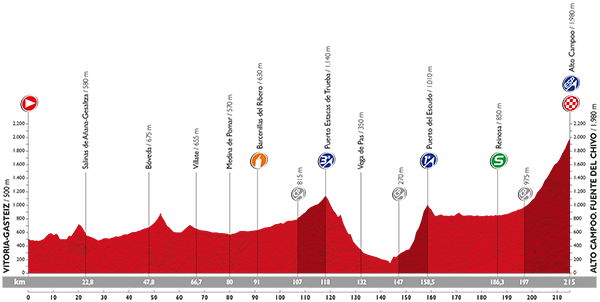 The Alto de Campoo is long and grinding but for the most part at a steady gradient, and that’s the sort of climb Dumoulin can ride well. Yes, Aru and Rodriguez both took time on him today but 50 seconds is nowhere near enough to put him out of sight before the time trial next week – he might be a little shaken, but he’s not the dregs of anyone’s cocktail yet. The next two days are going to be fascinating. 3. Jiminies it was cold. The Vuelta has thrown all sorts of weather at the riders, from the stifling heat and blazing sunshine of the south, to climbing through the mist at high altitudes in the north. You can see how cold it was at the finish, even Eurosport’s Vuelta Extra team looked like they were about to go snowboarding rather than interview cyclists. With so little body fat these elite cyclists have to be extremely careful after they finish the race. Warm tea, warm clothes and a warm shower are the order of the day. No one wants to pick up a chest infection now with the race reaching the crucial stages. Points leader: Esteban Chaves (Orica-GreenEDGE). Combined classification leader: Tom Dumoulin (Giant-Alpecin).